Orange was THE colour of the Flower Power generation: a new sense of freedom, enjoying life, throwing conventions over-board. Fresh, liberated, cheerful and with a great lust for life: orange wallpapers still represent these characteristics to this day, exuding excitement and good vibes. 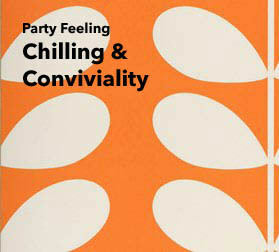 Party power, delicious dolce far niente, cool chilling and carefree conviviality are all part and parcel of orange wall décor. Choose wallpaper in orange, and your walls will come to life. Orange also represents the Mediterranean lifestyle, e.g. 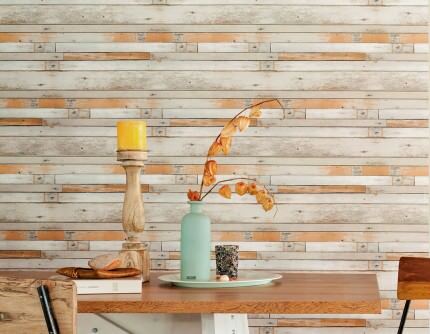 as stripe or structure wallpaper in warm hues. Fill your home with energy, impulsiveness, or warmth – the decision is yours! 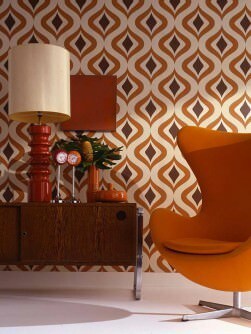 Retro wallpapers in orange are an integral part of modern interior design. No other colour expresses a joyful lust for life quite so perfectly. 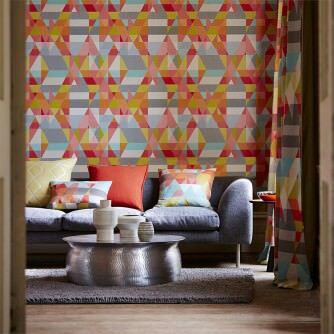 Geometric and graphic wallpapers lend movement to a room, abstract patterns and motifs add colour and excitement. But orange can provide very different effects, too, for instance when it comes in more subtle hues like apricot or salmon. Three-dimensional effects with a delicate silver finish represent modern elegance. Wall-coverings in orange create the light-hearted mood of a Caribbean night dancing on the beach, of sunny days far away from stresses and strains. 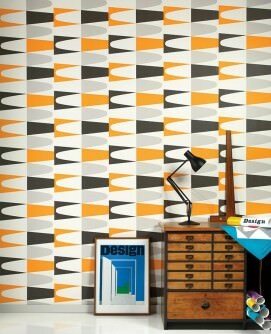 Discover the diversity of orange design wallpapers! The colour orange is known to have a positive impact on one’s appetite, which is why it is perfectly suited for kitchens, where it facilitates easy and relaxed family get-togethers over a good meal. When used in offices or studies, orange wall décor has an inspiring and reviving effect and sets the scene for ideas and inspirations. And your bathroom becomes an oasis of calm which creates well-being. Élan and a fresh youthfulness, creative impulses and relaxation – orange-coloured wallpapers introduce light and energy into any living or working space. And last but not least, it can be used to achieve that sought-after 70s effect! Find it all in our new range in the online shop. Orange wallpaper is an immediate pick-me-up, puts you in a good mood, fills the room with dynamic energy and increases creativity. It is also ideal for decorating rooms that are used for social occasions. Orange indicates zest for life and activity and acts as a signal. A room with orange wallpaper not only invigorates the senses but also gives off a whole new aura. Trendy orange designer wallpapers are just waiting to give you that energy boost. Combined with stylish retro patterns, floral patterns, traditional baroque or art deco ornaments as well as harmonising and contrasting colours and interesting structures, orange wallpapers are great for any room that you want to fill with life. The name of the colour orange is derived from the fruit of the same name. The colour is a mix of yellow and red and comes in different shades, depending on the exact colour ratio and whether black or white are added. The darker the hue, the browner it appears to the eye. Orange that is lightened with white becomes a pastel apricot colour, while orange containing a lot of red is often referred to as vermilion. If the proportion of yellow is very high, the end result resembles saffron. Orange can also be perceived as a basis for skin colour and, when muted and adapted, it is used for faces and limbs in paintings. Last but not least, orange is a colour that signals caution, especially when it comes to road traffic and labelling dangerous goods. In traffic lights, it is positioned between red (stop) and green (go). The bright signalling effect of orange plays an important role in advertising. Many large companies design their logos, word/figurative marks, shop floors and even workwear in orange. They use orange to consciously direct people's attention to the corporate philosophy, products and services. Orange sticks in your mind. Strength, power, status and unity – the Netherlands use orange as a symbolic colour. Even their national football team is kitted out in orange shirts. 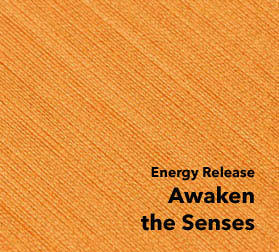 The strong level of energy conveyed by the colour orange can also be found in religions such as Hinduism and Buddhism, e.g. the clothes worn by monks. Here, orange is frequently used to signal enlightenment. Like the colour itself, some of the orange wallpapers in our Wallpaper Shop are bright and intense, while others are available in, say, light apricot or a burnt orange shade. This enables you to utilise the psycho-energetic effects of the colour orange. If there is one decade that revered orange in all its variations, it is definitely the seventies. In the era that gave birth to flower power, designers made heavy use of the vibrant colour that perfectly expressed the new and free attitude towards life. Cars, clothing, household equipment, technology and electronics as well as furniture, furnishings, wallpaper and carpets – orange conquered the world of design and made a major contribution to this iconic period. Because – as we said before – orange sticks in the mind. 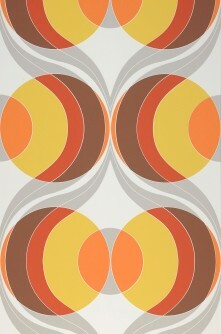 The new geometrical and, at times, psychedelic patterns of the time were simply made for bright hues of orange. 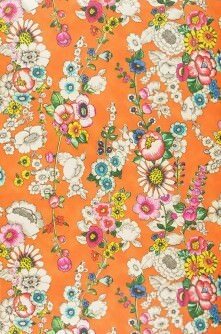 Even today, vintage design wallpapers in orange are very popular when it comes to decorating rooms authentically in the style of the flower power era. Of course, a lot has happened in terms of quality, colour intensity and wallpaper characteristics. 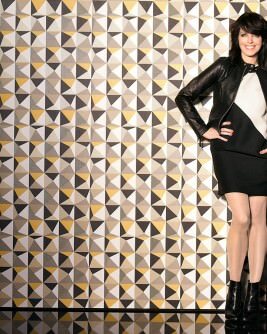 Our exclusive WallpaperShop offers "retro chic” in up-to-date quality for those wanting to opt for orange design wallpapers. The colour orange is associated with vitality, health, vitalisation, happiness, bravery, strength as well as sociability. It also stimulates the senses. Having orange wallpaper in the kitchen or dining room may even increase appetite. Orange can lift your mood and make you more optimistic. In psychoanalysis the colour orange is associated with communication, which is why orange wallpaper is said to promote conviviality. Orange wallpaper helps to invigorate, energise and brighten a room. It is also a firm favourite for decorating walls in the popular Mediterranean style which evokes images of southern climes and uses shades of orange such as terracotta or apricot. Base and accent colours influence the intensity with which orange affects the organism. Alongside orange, accent colours often include strong shades such as pink, violet, yellow or red. White and orange as base or accent colours offer a traditional contrast that never fails to have an invigorating effect. 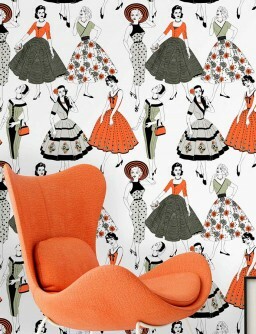 The brightening properties of orange wallpapers in a room should not be underestimated. 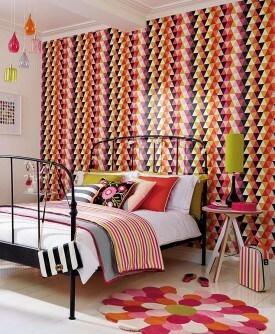 Orange design wallpapers are suitable for poorly lit and cool rooms as they tend to widen and warm their surroundings. 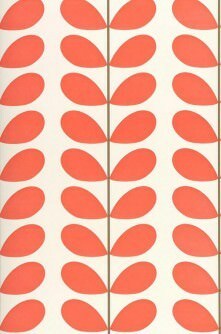 Almost any pattern works on orange wallpaper, which is why we can offer an extensive range in our Wallpaper Shop. You will find abstract patterns, retro designs, leaves, flowers, blossoms, twines, branches, objects, graphical elements, material imitations, people, animals and birds on orange design wallpaper. Atmospheric orange motifs or base colours are also available for nurseries and children's rooms as they create a calm mood and provide creative stimulation. 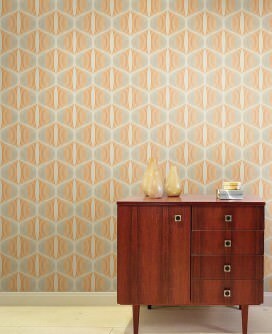 Geometric retro-designs or modern patterns allow for effective styles with a deep impact. Even traditional striped wallpapers pulsate with energy when designed in orange. Effects and structures provide orange wallpaper with a certain "je ne sais quoi". The fantastic surfaces of our effect foil or metallic wallpapersinorange play with light to produce ingenious and downright exhilarating effects. 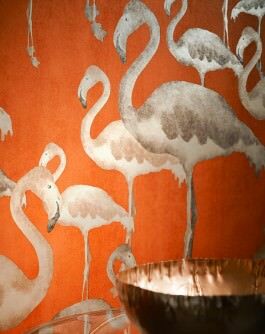 Even without patterns, unicoloured orange wallpapers shine as their special material structure creates movement. With its highly effective design and washable vinyl surface, orange leather wallpaper is a great and unique feature for any room. Precious diagonal warp threads create haptic stripes on our high-quality, warming textile wallpapers that are available in unicoloured orange. Orange is a very expressive colour that is perfect for trendy, relaxed and Mediterranean design concepts in both private as well as business/public spaces. In your home, there are practically no limits to the use of orange wallpaper – it looks great in the corridor, hallway, stairway, kitchen, dining room, living room, bathroom, nursery/children's room and office. The only thing to consider in terms of room usage is the level of the colour's impact. When papering entire walls, the pattern type and size, the base and accent colour(s) and the purpose of the room are very important. Feature walls can be decorated with fabulous orange wallpaper in any of the rooms mentioned above. The remaining walls should be kept in coordinated shades or white. Grey also makes for an interesting partnering option for orange, e.g. in the kitchen. In the nursery/children's room, a feature wall with orange design wallpaper can set apart the play and learning areas. We recommend using neutral wallpapers for the rest and sleep area. The reception area of your home (e.g. the hallway or corridor) looks inviting when treated with an exuberant hue of orange. However, please consider the size and layout of the room. Unicoloured or patterned orange designer wallpapers work well in a spacious hallway, while a narrow, small corridor would benefit from an orange feature wall. This could be the wall you see when you open the entrance door or a separate area of the wall, e.g. where you have your coat rack. 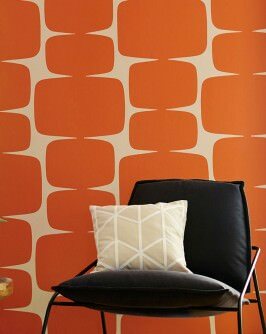 Orange wallpaper with retro patterns creates a very relaxed lounge ambience in a living room. Space-age styles or designs in the mid-century look work well with a large-scale feature wall boasting stunning orange design wallpaper. All-over orange walls are better suited to a flower power party den. Washability and durability of orange wallpaper are important factors in rooms such as the kitchen, dining room, nursery/children's room and bathroom. Here, wash- and scrub-resistant wallpapers are preferable. These specially treated wall treatments are also resistant to steam and can be used with confidence in wet rooms. Orange wallpaper can also have a positive effect in commercial or public areas. Use orange wallpaper on your shop floor or trade fair stand when launching or presenting new products. Visitors and customers will be magically attracted to the lively orange colour which acts as a signal. In reception or waiting areas of doctor's surgeries, hospitals and authorities, orange wallpapers set new benchmarks as they lift the mood, reduce fear and promote optimism. 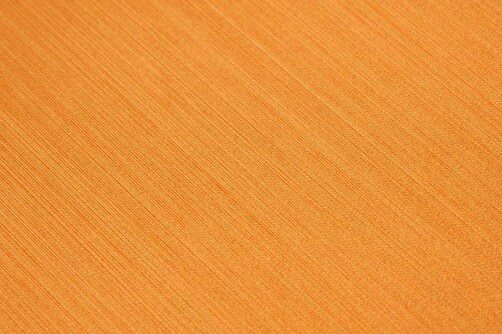 Orange wallpapers are a firm favourite in restaurants and bars as they increase appetite and make people more sociable. We offer orange wallpaper with paper-based or non-woven carrier materials. If you want to be able to easily remove your old wallpaper the next time you feel like a change, the best option would be to go for non-woven wallpaper that is strippable without the need for soaking and can be put up without having to paste the strips (as you paste the wall instead).